This is another quick and simple dish that makes a great appetizer or first course. Select an assortment of very fresh, flawless vegetables, and trim and cut them into long, elegant slices for ease of dipping. 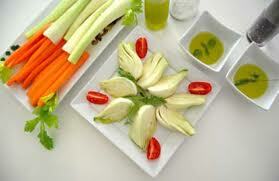 Some good choices are fennel, Belgian endive, radicchio, carrots, celery, red, yellow and orange bell peppers. Arrange the vegetables in a serving dish and place a bowl of Malibu Olive Company California Organic Extra Virgin Olive Oil mixed with sea salt and freshly cracked pepper alongside the serving dish of vegetables.